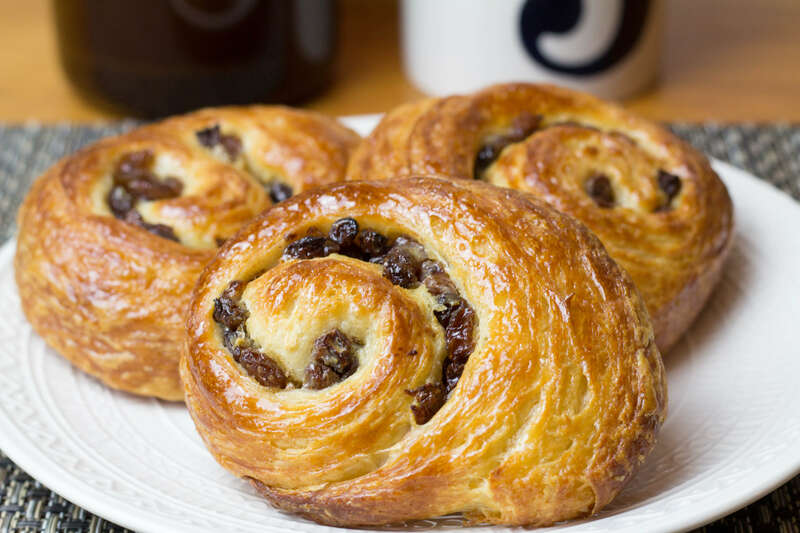 The king of all breakfast pastries for me is the Pain Aux Raisins. 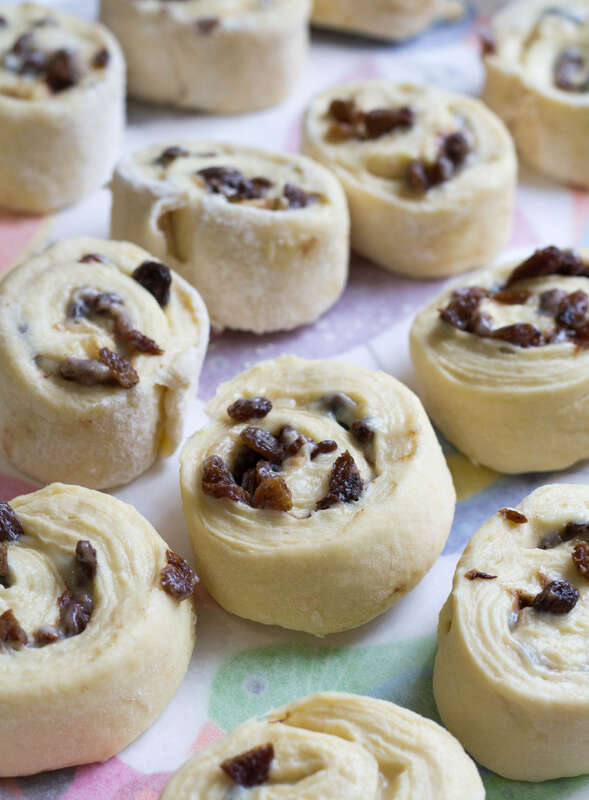 Plump raisins wrapped in a swirl of rich buttery laminated yeast risen dough, glued together with thick vanilla crème pâtissière, dusted with cinnamon to give a delicate background spice. 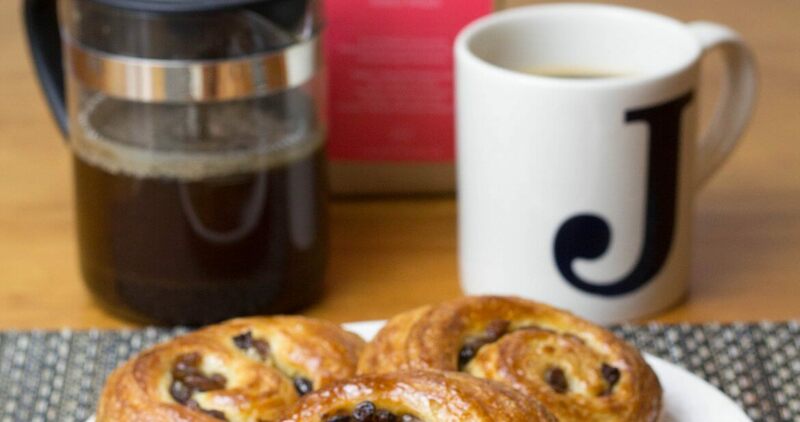 Alongside a cafetière or rich dark coffee to cut through the sweetness. My current favourite coffee is a fruity and citrus flavoured single origin Ethiopia coffee from a local artisan roasters “Coffee Officina“. 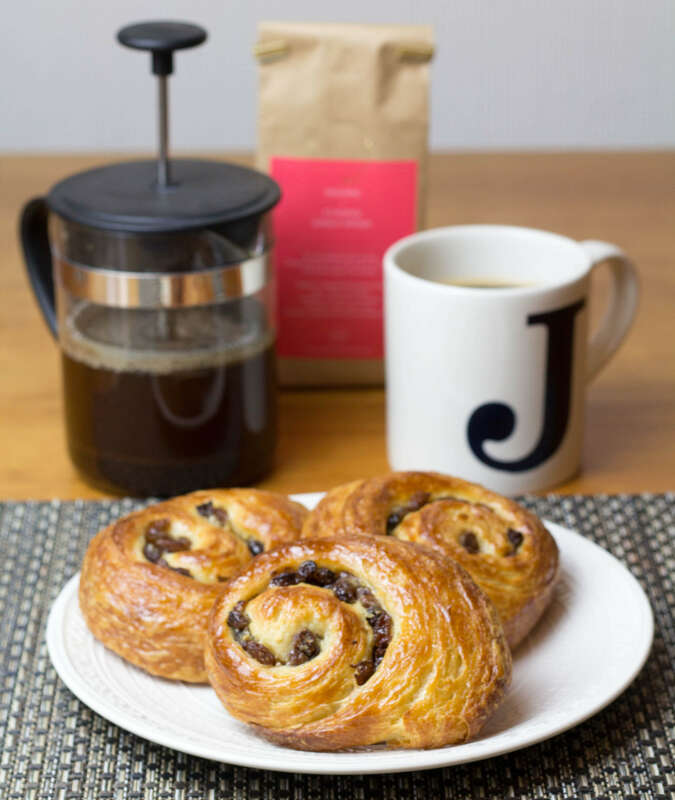 The only small set back is that making a Danish pastry dough is a whole weekend commitment. I start on a Friday evening making the dough so it can prove overnight in the fridge. Then through Saturday I attack the lamination process. Finally after resting the laminated dough on Saturday, I roll the pain aux raisins and slice. I then put them on a baking tray, cover in cling film and freeze. After about 4 hours you can take them off the tray, pop in a storage bag and put them in the freezer. Then the night before you want them, just before you go to bed, pull out as many as you need onto a baking tray lined with parchment. Cover lightly with oiled cling film. Leave them on the side for the morning. Then in the morning pop them into a preheated oven at 200(180 fan) for about 15 mins. I like to give them a brush with some maple syrup for a nice shine. Put all the dry ingredients into the bowl of a mixer. Keep the salt and yeast on opposite sides so that the salt does not retard the yeast. Combine all the wet ingredients together in a bowl, then add to the dry ingredients. Mix with a dough hook attachment for about 6-8 minutes until smooth and elastic. Tip the dough onto a lightly floured surface and shape into a ball. Wrap in cling film and chill in the fridge for an hour. On a lightly floured surface, roll out your chilled dough to a rectangle, about 50 x 20 cm. Flatten the butter to a rectangle about 33 x 19 cm, by putting in between two sheets of cling film and whacking it with a rolling pin. Lay the butter on the dough so that it covers the bottom two-thirds of the dough. Try to be neat and tidy. Fold the third of dough that does not have the butter on it down one-third of the butter. Now gently cut off the bit of the piece off butter you can still see without cutting the dough, and place it on the top of the dough you have just folded down. Fold the bottom third of the dough up. You will now have two layers of butter and three layers of dough. Re wrap the dough in cling film and chill for an hour. Unwrap the dough and put it on the lightly floured surface with the short end towards you. Roll out to a rectangle, about 50 x 20 cm, as before. This time fold up one-third of the dough and then fold the top third down on top. Wrap the dough again and chill for another hour. Repeat this twice more, putting the dough back into the fridge between turns. Double wrap in clingfilm and let your dough rest in the fridge for 8 hours or overnight. It should rise slightly. It is then ready to use. Pour the milk into a saucepan and add the vanilla extract. Bring the milk to the boil, then remove from the heat. Pour a little of the hot milk into the egg mixture, keep whisking as you pour. Whisk in the rest of the hot milk until well-combined, then return to the saucepan. Simmer the mixture over a low heat, stirring continuously until the mixture becomes like a thick custard. Remove from the heat and sieve the mixture into a clean bowl to remove any lumps. Add the butter and stir until melted and combined. Rest cling film on the surface of the custard to prevent a skim forming and allow to cool. Once cool chill in the fridge. 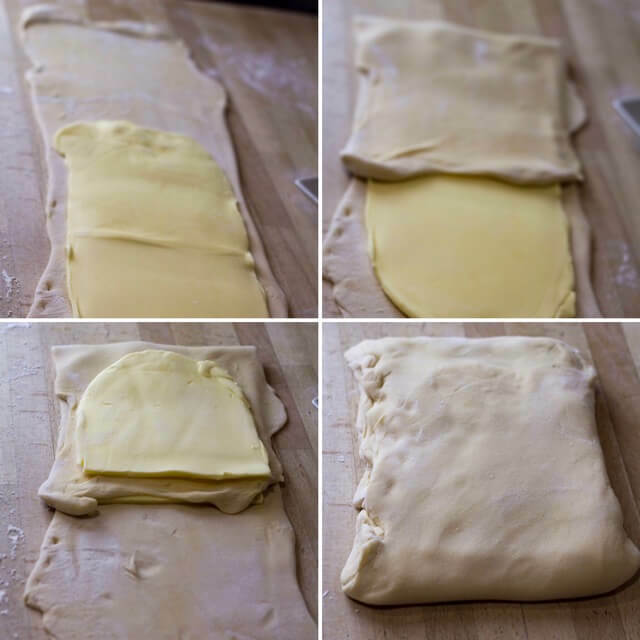 Remove the dough from the fridge and cut in half. Roll one half out on a lightly floured surface to a large rectangle, about 5 mm thick. Turn so a long edge is facing you. Spread half the crème pâtissière over the dough, leaving a 5 cm margin along the near edge. Sprinkle half the raisins and cinnamon on top of the crème pâtissière . Roll the dough towards you like a Swiss roll, keeping it tightly rolled and keeping tension on the dough as you roll. When you reach the end, wet the 5 cm strip you left with a little water and roll backwards and forwards on the join to seal. Repeat with the other piece. Cut the rolls into about 3 cm slices. Lay flat on the baking trays and gently lay some oiled cling film over the top of them. At this stage you can freeze them on the trays. Once frozen put into a freezer bag. Bring them out of the freezer the night before you want to use them and cover them with oiled cling film and they will be ready for the oven in the morning. Or if you want to taste the fruits of your labour now, leave to rise in a cool place until at least doubled in size, about 2 hours. Heat your oven to 200°C (180°C fan). Brush the risen pastries with beaten egg and bake for 15 – 20 minutes until golden brown. I brush mine with a little maple syrup as they come out but that is optional. Adapted from a Paul Hollywood recipe.